Advanced Dungeons and Parenting: Flash Gordon Returns to DVD on August 7. 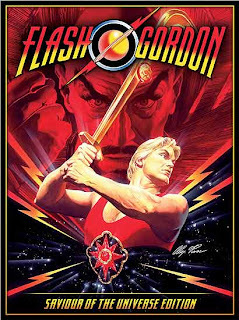 Flash Gordon Returns to DVD on August 7. I have fond memories of the weekend of January 10th, 1981. It was the weekend when I celebrated my 10th birthday and finally achieved what my father called "double digit midget" status. 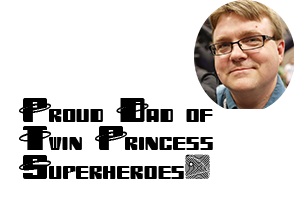 It was also when I was finally able to see Mike Hodges' Flash Gordon on the big screen. The film had been out for almost a month and I wanted nothing more than to watch a "modern" big screen adaptation of my favorite serial at the local theater. I had been watching episodes of the serial at my grandparent's house on the weekends and I was hooked. Sam Jones might not have been Buster Crabbe, but it was still Flash! by God. I am sure my dad was fed up with my begging by that weekend, but he happily designed the day around a trip to the film. It was a wonderful day, yet in the present I look back at the day with a mild sense of nostalgic melancholy. Not because of my distinct memory of the local DJ sawing the soundtrack in half "on the air," all because the station's listeners had decided the album was destined to be "Trash" and not a "Smash." Given how much I like soundtrack, I have distrusted democratic systems ever since. The note was almost universally returned with the aloof Maybe handwritten in and checked. Even at 10 women know how to be mysteriously alluring. Stephanie was my maybe. I have memories of walking to her house to play Atari during the afternoons after school. We would talk, laugh, and shoot each other's tanks while playing Combat. I can still think of no better date than two friends spending time together doing something they both enjoy. Atari with Stephanie was wonderful, but after Joe did his subtle "stretch while putting his arm around her" move at the theater those days didn't happen any more. Of course, I can't just blame Joe. My bizarre 10 year-old version of jealousy certainly contributed. It amounted to me attempting my own version of Joe's move. Needless to say it wasn't my best moment. Regardless of strain attending a movie put upon my friendships, I loved the movie. I loved everything about it, especially Timothy Dalton as Prince Barin. He captured a version of Barin I had yet to experience. Gone was the doughy and dim version from the serials, here was a dashing and charismatic rival for Flash. I could finally understand why Aura might be attracted to Barin, a concept that totally alluded me when watching the Buster Crabbe version. I hadn't read any of the comic strips at this point, so my Barin experience had been limited. Timothy Dalton was perfect for the role and brought an Errol Flynn aura to the movie. Flash Gordon is one of the few times that I have liked a campy version of one of my passions. A good campy film is a rare gem because it requires both integrity of adaptation while simultaneously taking jabs at the source material. I thought, and still do, that Flash Gordon achieves this delicate balance. The only thing I don't like are some of the visual effects, the weird reddish purple clouds get old, but I can forgive that. I recently wanted to purchase a copy of Flash on DVD, but was shocked that region 1 versions were running upwards of $50 on Ebay. I had resigned myself to wait for a new release and it looks like I won't have to wait long. Flash Gordon is returning to DVD on August 7th with it's "Saviour of the Universe Edition." The new digitally remastered version includes a painted cover by fan favorite comic artist Alex Ross (Marvels) and the first chapter of the classic Buster Crabbe serial, in addition to a couple of other cool bonus features. Though the version is campy, it remains honest to the source material and captures a lot of what attracted me to the 4 color strips when I finally discovered those. When watching the film, look for moments that inspired Star Wars that were drawn from the strips and the serial. Though Flash came out in 1980, the source material is much older and the "imitation" is of the source and not of Lucas' work. They were both inspired by the same muse, the pen of Alex Raymond. If they were to do a special theatrical release the same weekend I would wait in line for this film, melancholy memories and all.